Our Handmade Home: How to... Identify an Old Singer Sewing Machine. 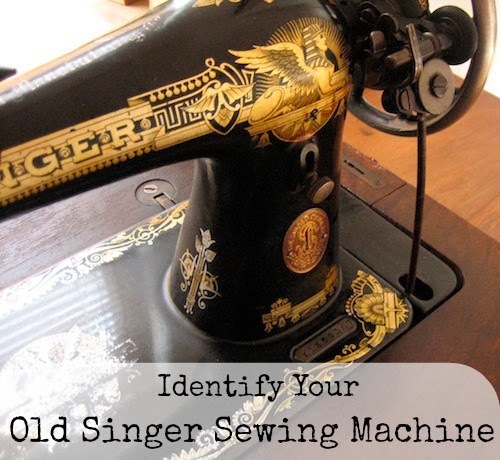 How to... Identify an Old Singer Sewing Machine. Please check out this updated post for more up to date resources. If you are trying to identify a year and model for your treadle or handcrank singer sewing machine, let me tell you how I identified my girl. I have given all the relevant links - remember I am no expert in this, but I struggled to find decent information and I am just trying to make it a bit easier for you. Knowing the age and model number can be essential if you need new parts for your machine, and it is always nice to know anyway. Of course, once you get your old lady working again you'll be giving her a new name and identity and I hope she is with you for many years to come. Here is my girl, her name is Nefertiti - she came to me a year ago and I cleaned her up and got her working again. She is reliable and even-tempered, a nice lady to have around. You will find your serial number embossed onto the metal body of your machine. It looks like a little plate but it is in fact straight onto the body and can't be removed easily. I'm not sure why you would want to remove the serial number, but I guess it happens. The position may vary slightly but mine is on the front right corner. Once you have your serial number pop over to this website and click on the relevant letter prefix, they have a pretty extensive database. It should identify the model number and the manufacture date. From this I know Nefertiti is a 15K model, 1 of a batch of 250,000, Made in 1923. 'date allotted' I am assuming is the date the factory decided to make 250,000 15K machines - it makes her feel not quite as precious and unique as you might think. click here if it has a single letter prefix. click here if it has a double letter prefix. So my girl was made in Clydebank, not far from Glasgow. The singer factory was famous, it was the biggest sewing machine factory in the world and was bombed heavily during WWII - The factory was closed and demolished in the 1980's but it's train station is still there and the area (now mostly housing) is still called 'Singer'. So my sewing machine has ended up about 30 miles from where she started... I wonder how many of her 250,000 twin sisters are still around. If you have part of the number you can check the year of your machine on the singer website, just follow directions depending on whether your machine has a 2, 1 or 0 letter prefix. If you have no serial number you can still identify the model that you have the sandman collectables website (though not the best interface) has a fairly easy to follow instructions - click on 'start here' and answer the questions as you go. I hope that helps those of you looking for more information about your old sewing machines. If there is anything else you'd like to know or I can maybe help you with, just let me know in the comments, I always try my best to answer your questions. The instructions above are for domestic, pre-electric models, and the most important thing you need is the serial number, but even if you don't have it there is another website linked above that can help. If you are really having trouble, do email me and I will see if I can help, I do like to help, I really do, promise. I've been getting an email a week, often just containing photos and a curt "what machine have I got?" message - I could start charging for the service I guess, but since I have shared all my resources already that seems a bit cheeky. Oh, and she is gor-geous! Thanks Micha but she's not so much... her decals have faded, and her balance wheel is badly tarnished. She was in a damp garage for a good few years before I got her. I have just (within the last hour!) become the owner of P191107 which looks almost identical to your Nefertiti. Like her she is in need of some serious TLC but I am looking forward to getting her well oiled and moving well again. I hope you wont mind if I occasionally 'pick your brain' if I can't find the information I need when searching. I'd be happy to help with anything I can. I couldn't help but go and find out, your girl is a 27K (so she will be a little different than my 15K) But she is an old lady from 1900. I would love to hear how you get on with her. Hi, I just got a Singer Sewing Machine that is in excellent condition, clean and it works great! I was wondering what year it was manufactured in, the Model# AK646195, I believe that it is a 1951 (it includes the manual) It is in its original Sewing Table and includes its original bench chair with leather cushion. It includes the Singer Buttonholer, Zig Zag, Blind Stich Attachments and another box of various attachments. Also can you give me a value on it? It is all in great condition, with hardly any wear. Yes, November 1951 by the looks of things, and she's a 15K which is the same as mine. You are lucky to have her in good condition and lots of little attachments, very exciting. As for value... that is anyones guess. I am regularly contacted by people who get their machines out of skips/dumpsters or from freecycle. I have seen some being sold on eBay for around £50 but frankly these machines are not worth a lot... then again it all depends if you find someone willing to pay whatever you want to sell for. Sorry I can't be of more help. Hello Im not sure if you got my last message but if you could please help me identity the sewing machines i have. Ones Serial # is AH609045 and the other is older Serial # L909499. I have had my singer for 20 years and have done nothing with it. (It was just so cute!!!!) From the Af088275 I think it might be 75 years old. So far everything I can find for the feather weight (which it is) they were not made that long ago. How can I find out . Also how do I clean her? she still look wonderful. Hope I can look 1/2 as good when I'm her age. WOW HOW EXCITING IS IT. I JUST WAS GIVEN AN OLD GIRL SHE'S A 66K 1920, HAVENT NAMED HER AS YET, BUT SHE SEWS LIKE A DREAM. I THINK ILL NAME HER MARSY OF THE OLD LADY WHO OWNED HER. Really interesting reading, I have just been given a Singer treadle sewing machine, Sphinx design, 3 drawers either side, serial number 16363068 (no prefix). Beautiful looking machine. It does need a little TLC as it has also been stored in a garage for a while but the mechanics seem to be ok, just the veneer lifted in places. I took your advice and checked the serial number on the Singer website and it appears to be made c1899. Amazing that it is still here and essentially still working! I just need to learn to sew now! Sad days clearing a house, sorry about that, but I am glad you found a little treasure in there. Hi - we have just been given a lovely old Singer machine (hand-crank). Checked out her details and looks like she's a 15K from 1910 . Great condition apart from the veneer lifting on the domed case - and the key for the case is missing! Any ideas where I can get a replacement - or what type of key she'd need? Any ideas would be great as someone has forced the lock and would be good to get her back into tip-top condition. Keys for the machines are easily available on ebay for about £5 each, there are 3 types available I think. I don't know which you would need though, perhaps there will be details on the listings on ebay? I have 2 Singer Treadle's in very good condition in cabinets but can't find the Model numbers ... Serial # G7785697 & AA185382. I haven't used them for years ... have considered selling them but can't decide. Both are from New Jersey. I used the links that I've given above to find the information, it might take a wee minute to scroll through but all the info is there. Mine is also a 15K from 1910, made in Clydebank, F7776862. They made a lot of them though so a key shouldn't be hard, thankfully someone has tied the key to my case though! Thank you very much Ann for the page, mine was my grandmothers and has been sat at my parents until I had a big enough place for my sewing so I am now cleaning her up (as per your link in a post above) and familiarising myself with all the bits and bobs, I too struggled with identifying the model until I found this page. Still searching for a name for her but I'm sure that'll come with time. Any tips for beginners (ish - used to be okay but haven't done much since I left school) on a hand crank would be greatly appreciated. So glad I helped you identify her. - play about on scraps of fabric for a while to get used to the machine. The serial number on mine starts with a 'C' and they don't have any information about them. :( I'm so sad. When I found your blog I thought that finally I 'll be able to identify her, but no, still a mystery. The only thing I found was that it was made in Wittenberge, Germany sometime after 1908 and an interesting piece of information. "When Russian army invaded Germany in 1945, they stripped all the machinery from the Singer Company's Wittenberg factory." It is frustrating that there isn't any more information but maybe the records were also lost from the factory when the Russian army invaded? I would imagine that the rest of the records weren't computerised until the 80's.... only a guess but maybe that is why. I'm so excited I found this site and even more excited that tomorrow I pick up my "new" Singer 15K tomorrow. I happened into Salvation Army yesterday during a 1/2 off sale so my working machine and cabinet only cost me $45. It has a box of parts, the operations booklet and seems to work great. I'll check out the serial number and check back to see what year it was manufactured. So excited!! Hi Ann, I just wanted to say thank you for all the great info I found in your article. I have been looking for this exact type of info for a long time and it just took me a couple of minutes to get it all by following your instructions. I actually have a " little sister" Nefertiti version, thanks to you now I know it was also made in Clydebank, though a bit later in 1934, and you will be amazed to know it landed in Romania :). It only had one owner until me, my grandma. She was just 8 years old when my great grand-father gave it to her, and I was about the same age when she taught me how to use it :). As an anecdote I remember her saying the people that sold them (this was 1935-1936) were going around the villages in Romanian countryside and offered free sewing lessons to little girls whose families bought the machines. She loved it and took such great care of it that now that I have adopted it all I had to do was identify the model and find a manual, just to learn how to maintain it. Thank you for making it so much easier for me. These are such beautiful machines and so often loaded with so much history and emotion. I have a Singer Sewing machine that was owned by my mother in law. I would be most appreciative of your help with my mission? My best guess is 1971/72 . Machines with the letter prefix 'AT-' were made in 1971 and they do tend to run chronologically. I'm guessing it is a full electric model that you have? These are not my forté I'm afraid. Hi! I purchased a beautiful Old Lady, y7614494, which, thanks to your information, is a 66k, made in Jan8 1930 In Clydebank, Scotland. Wow! You can't get much further than South Australia before coming back again! Just been given a 201K, 1939 model EC230733 like yours was made in Clydebank. Not in such perfect nick decal-wise but works well and is sooooo quiet! The former owner unfortunately had a pin cushion wrapped around the top, leading to undescribably heartbreaking scratching where the decals are. It has electric with a knee operated pedal and thankfully came with many accessories. Missing the manual but that doesn't matter. I love seeing and hearing what other people have done with restoring and using these gorgeous old ladies of the sewing world. Thanks for this blog site. Was handy to look up the information. Hi. A wonderful website! I have just inherited a 1923 singer Y8633635. It came out with my great great aunty from Italy to Australia in the 1940's. It is a well travelled sewing machine. Your site has been a great help in "filling in the blanks" of where it came. You can read my grt grt aunt's name, address and purchase date is handwritten inside one of the side draws. I've just come across a receipt for my grans treadle machine, checked the sites you recommend and I can see it was made in Scotland in 1922. The receipt is dated november 18th 1926 , from Singer Sewing Machine Co. Ltd , Great Bridge, Tipten. I assume this is close to Birmingham.The machine cost 14pounds, ten shillings. It is still in working order and looking good. Quality. Iv just been given a singer by my mum they is ser no on the moter at the back wich is k7685847 but also one on the plate at the front ek01809 could you help to see how old it is still working and in a highly polished box. Of course!!! I have an old sewing machine.My sewing machine having the several problems many times .If if any problem i will share you regarding singer 132k6 . Thank you for sharing this informative blog.. I just rescued an old hand crank Singer and from researching the site, she was born in 1889. Her decals are heavily worn and sadly, I can't tell where she's from. But needless to say, I'm thrilled to have her. Now to clean her up and see what she'll do. Thank you for the information! So excited! I picked up a 28K on the weekend from a garage sale, manufactured 1909. Also came with a buttonholer (not sure it actually attaches to this model..) She is just gorgeous. In perfect working order and recently been serviced. Just need to polish up all the plates. Some of the decals are a little worn but can still be seen. She was made in Scotland (part of my heritage) so that means just that bit more to me. Now all I need a name. Cheers! Just cleaning out our 87 year old dads home and we found my grandmothers old singer,, now we cant open the box as it looks like it needs some kinda key on the side .. there is no key so I don't know what make or model it would be , can show you a photo of the box with the handle to carry it if that help, wherwe in the world would I get a key to open this?? There are, I think, 3 different styles of key. They are easily available on eBay. The type you need is possibly specific to the model number but you might be able to get an idea from the key sellers on eBay. Thank you very much for the information, this morning I bought a cousin of your Nefertiti in Barcelona's old market. It's sr. nr. is 1368221, so I guess It was made in Glasgow too. Singer's web is not working now. Hatshepsut is the name of my new friend! I payed 25 Euros, Is It a fine price? I have just sent my Granny's old singer to be serviced as it doesn't work too well, I can't wait to get her back to find out how old she is. I'm going to call her Eliza. I have lovely memories of turning the handle for my gran while she made dolls with big skirts to cover a toilet roll to decorate your bathroom, they were very popular back then (honest). Hi, mi singer machine serial number is C6765437, i hope you can help me to know more about my sewing machine based on this number. Hi, I've just found your blog whilst researching my own Singer machines. I have three that were built in the Kilbowie factory, but they are now a long way from home, now residing in Sydney, Australia. I also have a 1900 Model 27 that my husband has started to restore. I can't wait for it to be done! I'm looking forward to reading more of your posts. I came across a DVD of the Clydebank Factory - it's a full length silent documentary of the Great Singer Factory in its heyday, shows the buildings, manufacturing processes, around 1935-36. It's extraordinary footage (if you're a bit of a Singer anorak like me!). What was amazing to me was that my machine is dated from 1936 so could be one of the ones you see being made and assembled during the film. I rented it from Scottish National Archives, and on enquiring how much to buy, found they had a special offer on, it cost £15 and they refunded my rental payment. Just got my 99k back from being fixed and have found out she was made in 1949 in Clydebank. Have worn myself out trying to identify the decoration on her using the International Sewing Machine Collectors Society website, machine downstairs and heavy, computer upstairs. Tomorrow I will make a start and sit down with the instruction book and find out what bits do what as also have a few attachments. Thanks Granny for looking after her, I hope she will be patient with me. I have Just bout a Singer with a Serial Number of K9767789....the web site says is is 1903 but as it is electric I am not sure... Does anyone know when Singer went electric?? I have a Singer serial no. B5139980A . Motor catalogue BU7E SIMANCO 4641110 . I see from elsewhere on the web that it was made on August 15, 1904. That chart says it is a Model 31, but sandman's questionnaire says it is a 99 or 99K or 192 or 192K. And that the B means it was made in Elizabeth, NJ, but the A at the end means Anderson, SC. Can you tell me why it wouldn't be one of the questionnaire model numbers, and which location it was in fact made? The research notes I have given above really only work for handcrank or treadle models. Perhaps in the future I will try help with electric models. I would suggest that you clean up the machine... they are pretty indestructable and, if all you want is for her to run smoothly again, I'm sure you can clean her up just fine. I've got a article about that somewhere on the blog if you have a poke around. This is all so fun and fascinating. From following the links you gave above I have figured out that my machine is a Model 201, manufactured in 1952 in Elizabeth, NJ. My mom, who's 92 and still going strong, bought it the year my brother was born and now it's come to roost in my home. I really appreciate your providing those links so that I could determine the model number because I'm trying to buy a missing part. I can't seem to find the zipper foot attachment and I want to make some chair cushions for the chairs that go with my grandmother's table that is 150 years old! Here is my question: I found a number of zipper foot attachments on eBay and some of them say for they are "low shank" and some say "featherweight". For example, this one person is selling "8 Low Shank Presser Feet for Featherweight 221 201 99 66 15 Machines". I zoomed in on the picture and I see the zipper foot. I just don't know what "low shank" means and I don't know if my machine is a featherweight or not. It's a regular size machine and it's in a table with a square leather padded stool. Any assistance you could provide would be greatly appreciated. Thanks so much for your help and your interest and all the fun and fascinating comments. I am trying to figure out the model of this singer sewing machine that is part of an estate. I went to the website you suggested and they are close but I still don't think I have the right model exactly. It's very similar to the model 15-98 crank. Can you help. I can send pictures to an email if you like. Best place to start is the serial number Kingcat. Sorry I can't offer individual identification. I'd have to charge for the service as it takes quite a lot of time. I found a SINGER sewing machine today. It was thrown away and I'd like to know its date. The serial number is 0542383. I'd like to get working again too but I don't know how to do it. Thanks so much for this information. I had found my machine in a thrift store, this is great information! Thank you thank you thank you!!!!! I'm a happy girl, as I needed the manual, to read up on my machine, been awhile, as I lost my original one from my great-grandfather when I divorced my 1st husband. That one was older than this one, but that's ok. This one works like a charm, just trying to remember how to thread the bobbin! I'm a happy girl, with a manual now! woot woot! Thank you sooo much! I found my little gem at a thrift store they had her priced at $50. When I checked her out I plugged her in she ran at high speed without having to touch the peddle. LOL. It didn't matter, I'd been looking for her such a long time! So I got her, brought her home and hubby took a look at her. They had the wires backwards so it was an easy fix. And with your blog I found out she was manufactured on January 6, 1920 in Elizabeth NJ. She has the same markings as yours, I haven't named her yet. I also found a pdf manual for her here http://www.ismacs.net/index.html. There are many manuals there for anyone looking. I am soooo in love with my girl and can't stop smiling...Thanks again! I have done a bit of research myself, I can hardly find out anything about The Avenue Sewing Machines. I can't find any reference to them being made by Singer but I do know that they were manufactured both in the USA and in South America (machines are either stamped U.S. America or just S. America) This leads me to believe that they are a different make to Singer, but I'm willing to be proved wrong if you know differently. Sorry I can't help more, but I found very little on the internet. Singers are considered to be among the best sewing machines so a replica is not out of the question. Does it have the Singer badge anywhere on it? Hi, i looked at your websites and i cannot find out exactly when the singer that i have was made. It has the serial number Y9146890 i cannot find this number on any of the sites. Also the one that is in my house looks to be in pristine condition and it has a box full of interchangeable feet for the machine. the mechanism works smoothly and precisely. So with all that in mind i was wondering if you had any idea on the price value? It was made in Clydebank, Glasgow. I have written a guide as to prices, they are not worth a lot - follow the links through the sewing machines tab to find out more. I inherited an old Singer that I gave my Mom around 30 years ago. It's AC327507,a 99K model. It is still in it's wood domed carrying case. I am not sure if mine was electric when it was made or that was aded later. I'm still researching that aspect. Thanks for your helpful information! It certainly made finding the information about my Singer easier to find. Really, I don't know much about the electric models at all, but glad I could have been of some help. Hi! I just picked up my 15-91 this past weekend she's a Jersey gal from 1948. LOL I loved how you identified your machine and I have a tip to help put a bit of sparkle back on your handwheel. Get a piece of aluminum foil crumple it up in to a little ball, a small bowl of water and then dip the foil in to the water. Rub it on to the hand wheel. It will help clean up the tarnish. I picked up this tip from the american restoration show on tv and have used it on a couple of old chrome needle plates that were a bit rusty. They're super shiny now. Brilliant, I'll try the aluminium foil trick and see how I get on. I just received mine - from my little sister who inherited it from her English babysitter. She learned how to sew pockets on it. It was manufactured in 1937 in Clydebank Scotland. It has a littel box built in to the cover full of different feet - even a button holer. Your links made it so easy to find. Do you recommend professional cleaning? It feels a bit oily all over but I don't want to mess up the decals. I saw the post about using foil for the wheel. I've lugged around for 30yrs a machine. Now clearing out so thought I would age it with help of this site. its a s/n starting with 1 but think it really starts 12 because there might just be another digit at the end. This places her manufacture in 1895. Wow. Maybe I'll clean her up, rather than find a new keeper! My name is Mike. I have an old singer sewing machine, foot pedal operated. My wife ordered my to garbage pick it a few years back. The wood is rough. But the machine still folds out and in nicely. Wondering if there might be a market to sell it and what I can expect to get from it. The serial number 5381418, no letters. So I have an old foot pedal operated singer sewing machine. My wife ordered me to garbage pick it a few years ago. She had thoughts of redoing the wood. (Wood is in rough shape) some wood pieces missing. The machine still folds out and in nicely. The serial number does not have any letters. 5381418 is the number plate. Wonder if there is a market to sell it in South East Michigan. Let me know what you think. Thank you so much for the information in this blog! I just learned the machine I bought in auction, St. Augustine, FL, USA, was manufactured in 1890. Even though it may never operate (it's incomplete and in rough shape), it will be a nice addition to my sewing area! Just 'happened' across this page and pleased to say that my grandmothers treadle, now in my possession is a Y girl and also came from Clydebank, Scotland. How fascinating, as I live at the bottom of the world 'down under'. I believe my machine is a 1928 lassie! Hi I have a old singer machine which has been converted to electic. The serial number is F8024380 anyone help with the age? I have a singer sewing machine in the cabinet but u can't read the serial # it is very worn. Cabinet in bad shape veneer is peeled away. Got any ideas on how to repair her? Hi, I found an old signer sewing machin with stand, manual, Tools, accessories, wood bobin, and many more. I found it in an old abandoned house. Serial # G3591045, now if i did it right she is model # 127, only 20 000 of her was made, date is april 22nd 1914, Note; st-Johns, don't know what it means but that is what i found on her. She was made in Elizabeth, New Jersey USA, and i don't know if she has a name or not. Would like to know what could be the value the stand is in good shape but a bit weared out on spots. Thanks for a very interesting article. I have a 15K electric in a table,could i still use it safely if I removed it from the table,as in,would it be stable enough? I'd appreciate your opinion please. I like your site and wanted to let you know that I was looking about more information about my "new" singer model 15 I bought yesterday here in Brasilia Brazil.the serial number is C-4221014 and it was made somewhere around 1908. The machine is in prestine condition and looks like it has hardly been used. The story behind this machine is that it belonged to a very old German lady that did not use the machine very often. I am a man 54 year and like to do leather projects and this is my first machine and am looking forward to using her for the first time. I see that everyone names the machine so I will call her "Old Betsie" Thanks for your Post. I love getting your comments, they really make my day! I try to respond when I can. I moderate all comments to cut out the stinky spam. So please be patient if it hasn't popped up immediately. If you ask a question remember to check back for an answer later. How Should I Clean My Vintage Sewing Machine? All content and pictures copyright of Our Handmade Home and Ann McG, all rights reserved. Powered by Blogger.